The Local Flavour is a young company (1997) that is specialised in the wood mushroom’s market. Our company have the chance to be situated in Canada where the untouched lands give a high quality product. We are also commercialising other products like berries, wild plants and mini-veggies. Those products are aiming an always growing customer’s circle formed by all the gastronomic amateur, from the occasional customer to the art cooking’s professional. 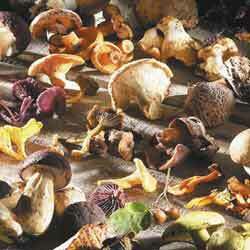 Over 30 species of edible mushrooms.